The property is underlain by a volcanic assemblage striking North South and gently dipping East. This volcanic series belong to the upper part of the Central Camp mine sequence. It is overlain to the East by a 200 metres thick gabbro sill and limited to the south by the Lac Dufault batholith. The contact between the Amulet andesite and the overlying Newbec rhyolite is a favorable horizon for the discovery of volcanogenic massive sulfides. The Newbec lens is associated with a synvolcanic fault which cross cuts the sequence from West to East. The old Newbec mine consists of several small sulfide lenses located in a fault zone at the contact between the Amulet andesite and the Newbec rhyolite. A historic resource calculation indicates that about 9 000 tons at 6% Cu are left in the underground workings. Several surface samples show good copper values along the strike of the horizon to the North. Furthermore, a zone of Copper-Nickel-Palladium enrichment was discovered by Falco in 2014 along the base of the eastern gabbro sill. The Newbec sulfide lens was discovered in 1925 and mined in 1930, but due to low copper prices, only 278 tons at 6.83% Cu were sent to the mill. Since then, several companies performed exploration surveys on the property including mapping, sampling, airborne and ground geophysics as well as 78 diamond drill holes. 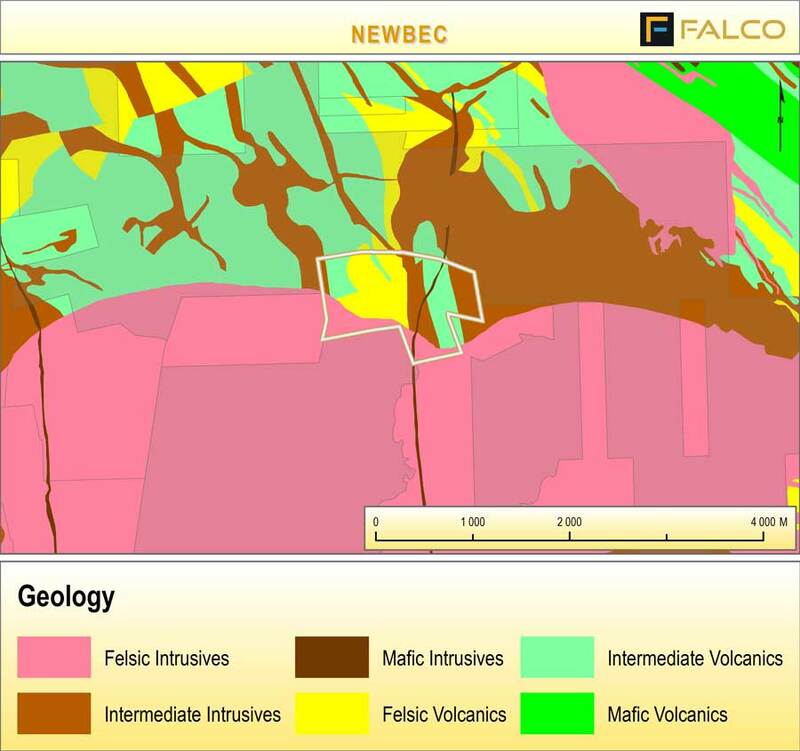 In 2014, Falco performed a surface sampling program including stripping and channel sampling – the result of which was the discovery of a new copper-Nickel-Palladium showing at the base of a north South trending gabbro sill. The Newbec property is a Brownfield exploration project and consists of 8 claims covering an area of 126 ha. It is 100% owned by Falco Resources. The Newbec property is located in Dufresnoy Township, about 15 km north of the city of Rouyn-Noranda.